Another lockdown and denials and secret burials still continue. Monday March 30, 2015 - It is with great relief and a sense of joy and victory that we have to join all those who wished a UK medical nurse who was infected with the Ebola Virus Disease well. Those prayers have been answered and Corporal Anna Cross has now been discharged from hospital after a fortnight of treatment. In the meantime, today Monday sees the end of a 3-day lockdown which started on Friday and officially ended yesterday Sunday March 29th . It was organised by the very wretched of the earth, thieving and unrepentant criminals to the core involved in the battle against the scourge and calling themselves servants of the people. 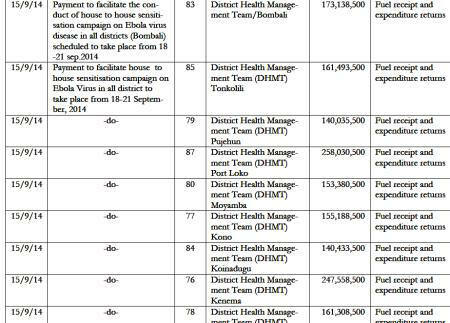 Another opportunity for the rat and his band of thieves to plunder the Ebola funds. 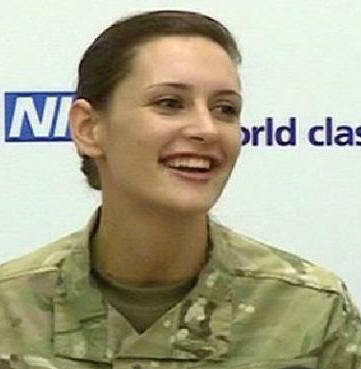 Corporal Anna Cross a nurse serving with the UK medical contingent in Sierra Leone has been declared free of the Ebola Virus Disease after she got infected while serving in Sierra Leone. According to a BBC report the brave 25 year-old nurse from Cambridge is the first person to be treated with the experimental Ebola drug MIL 77. During her illness she's reported to have lost ten kilograms/22 pounds but her remarkable discovery in just about a fortnight of treatment at the specialist Royal Free hospital in the UK again highlights the point we have always stressed. As soon as somebody is confirmed as having the disease, all resources should be made to bear that would see every available medical help being made available to those helping the afflicted. The Ebola Virus Disease has shown over and over again that it is a vicious, treacherous and extremely cunning killer that would use every deceptive move to hoodwink as it rips apart its victim's immune system thereby opening the floodgates of attacks against life-sustaining tissues, breaking down resistance to its attack. Again we say - time is of the essence and any time lost in administrative and other peripheral but quite unnecessary procedures without paying attention to the victim could well have resulted in our losing so many health care and delivery workers including porters, drivers, technicians, nurses and doctors and of course patients from the poor and unconnected section of Sierra Leone society. Meanwhile yesterday Sunday March 29, 2015 should have seen the end of another 3-day lockdown aimed at totally containing a virus that appears to be on the decline as far as new infection rates are concerned. It is hoped that revelations made in the report of the Auditor General will help make this a success and reports that some sections of the Western area community were being supplied food during the lock-down again points to a lack of planning. While the last time round in September last year a great show was made of volunteers handing out soap to a hungry populace forced to stay at home while contracts were illegally handed out to those favoured by the rat and his thieving cabal, this time round there was an attempt made to feed the people. How many of the poor got fed is quite another matter but we would not be surprised to hear of "hundreds of thousands if not millions" fed by the lying and thieving cabal. 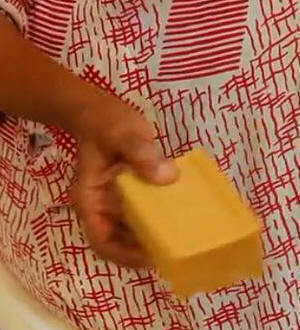 In some parts of Freetown, it was reported that rogue security forces were freely discharging canisters of tear gas in a bid to scare off hungry residents. Last time round, according to the audit report, even though some nine hundred million leones were dished out to the police and the same amount to the military, the report exposed double payments to security personnel who were given a part of the stolen funds for which they signed as health care personnel!!! "This lockdown comes amidst some rare good news. According to official figures from the World Health Organization, there were just 33 new confirmed cases last week - the lowest number since June 2014. But with these falling figures there is danger of growing complacency, the government says. This is one of the main reasons behind the lockdown - volunteers will remind people how to protect themselves against a virus that is still a real threat. 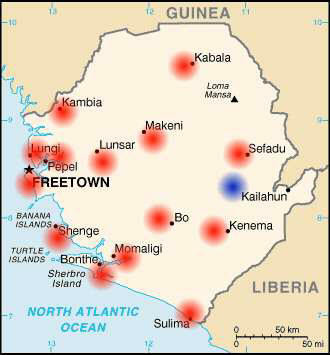 They will focus their efforts on northern and western areas where some infections still come as a surprise to officials - 16% of cases last week were not known Ebola contacts. Experts have criticised previous stay-at-homes as too heavy-handed and top-down in their approach. Concerns were raised that some people did not have access to food. 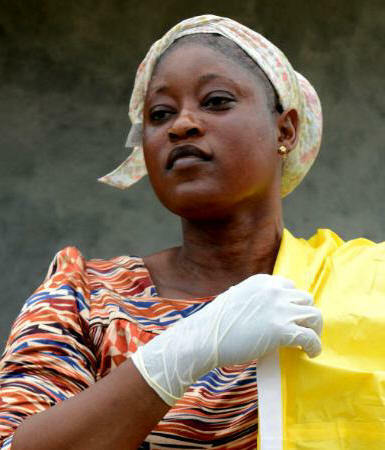 The hope is, a year after the outbreak was declared, such logistical problems have been ironed out and that this measure will bring the country closer to its goal of zero Ebola infections by April 2015 - an ambitious target that is just two weeks away." We heard for the first time during a lock-down exercise and on the BBC by one O B Sisay that food was being provided - something that was absent in the last exercise. Even as hopes rise that the Ebola Virus Disease is getting under control, we would again re-iterate what experts have stated about the disease. Don't allow complacency to step in as the disease is known to thrive and multiply very rapidly when conditions are created that facilitates its spread. It is quite a sombre reflection on what obtains on the ground as the authorities have insisted that although the 3-day lockdown is on a nation-wide scale, four districts have been highlighted as bearing the greatest responsibility for new cases as well as increased spread. 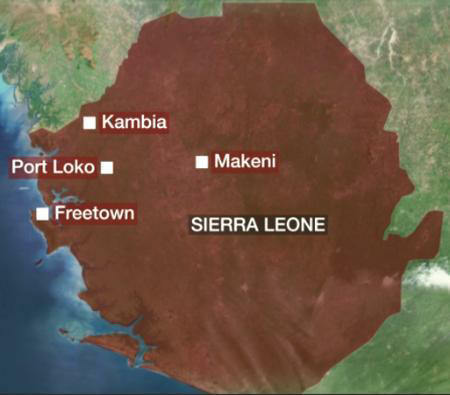 These are Kambia, Port Loko, Makeni and the capital Freetown. What clearly emerges from reports on the ground is that apart from the culture of denial that there are cases of people struck with the disease, the unwholesome and unsanitary conditions in overcrowded slums increase the chances of the disease remaining well embedded within such communities. Pictures of pigs living side by side with human beings in filthy conditions do not augur well for the fight against the scourge. It would also be recalled that at the height of the growing menace, we advocated that emergency holding and treatment centres be set up to take care of the rising cases rather than sending all suspected and confirmed cases to the overstretched facilities in Kailahun and Kenema. We would still want the Auditor General to give us an update on the funds since the last six-month record which clearly indicated that the resources looked into has not taken into consideration the effort and input of resources brought in by international NGO's as well as funds received from bilateral and multilateral agencies. We would also urge the Auditor General to investigate funds generated by our missions abroad after receiving reports that a good number of mission staff abroad have been setting up accounts to which they have directed those interested in the fate of Sierra Leoneans to pay in money and kind. We have read reports of the rat's envoy to South Korea receiving funds from that government and we would also like to know what other countries have chipped in to help the fight against the scourge. We know that in the UK the head of mission, Eddie Turay has even gone as far as to seek help from schools and that in one instance he was the proud receiver of school materials. We would want to know what his staff have been up to and if they have all accounted for funds collected. The mission accredited to the European Union countries would also need to come out clean so that the people can know what happened to funds collected on their behalf.